While I was sitting down staring at my 2018 goals in my bullet journal, I noticed so many of my hopes for the year are related to mental health. 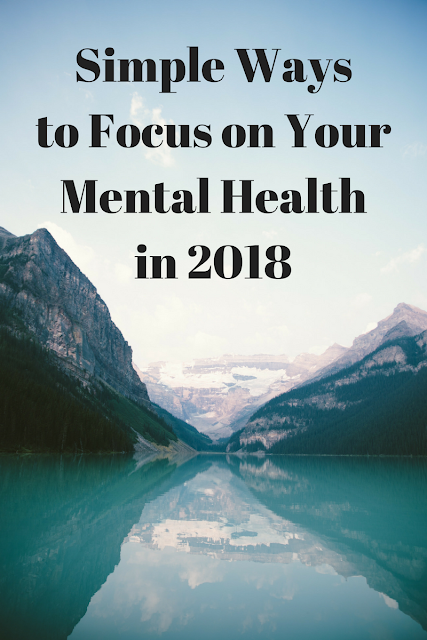 I thought I would do a blog post about why it's important to focus on your mental health in the new year, and why I'm glad I started focussing on it in the last couple years. Make sure to read my last post, Simple Ways to Stay Grateful in 2018, because staying grateful and thinking of everything that makes you happy helps with mental health, too! While it's great to stay updated on what's going on in the world, it can also be extremely stressful. Instead, listen to your favorite music or podcast, read a book for ten minutes, do yoga, meditate, go for a run, or anything else that you enjoy. I look at the news after I've done something that makes me happy, and it definitely helps me from feeling immediately down! It's not always possible to start going to sleep super early, but try and go to sleep a little bit earlier than usual so you can get a full nights rest. I'm sure you've heard this tip time and time again, but it's because it's the easiest way to feel better. As a college student, I definitely struggle with this, but on the days where I do get seven or eight hours of sleep, I feel so much better and can function throughout the whole day. This seems so simple, but I can't stress enough how happy it can make you. I personally follow Thoughts of Dog on Twitter because I love dogs and it never fails to make me laugh. There are countless cute animal accounts, and following them and filling your timeline with cute puppies and kittens can go a long way with helping your mental health. If you aren't ready to talk to a counselor, reach out to a friend or family member and talk to them whenever you feel stressed. It's scary making that first step to talk to a professional, but it's a lot easier to talk to someone you already know really well. What's really important is that you're just getting any feelings of stress or anxiety out, or at least sharing with someone that you're not feeling you. At the end of the day, the person that matters the most to your mental health is you. This is something that should be obvious, but oftentimes we spend our lives trying to please others, but it's perfectly okay to be selfish and have a day entirely for yourself and doing something that makes you happy. I'm super guilty of this because I like to make sure everyone around me is happy, so a lot of the times I put my own feelings to the side. So many people do this, especially if you have anxiety, but it's important to take a step back and re-center your focus to how you're feeling and how to feel better. These are all super simple ways to start focussing on your mental health, which is so important. Since it's still January and the start of a new year, it's the perfect time to think about caring for your mental health. It's never too late, though, and these tips can be applied to any time of the year! At the start of college, I was going through a lot with my family, so I started to focus on my mental health like never before and it helped me push through a really tough time. I still have so far to go, but by being mindful of how I'm feeling - physically and mentally - I've started to feel better. Staying on top of your mental health means something different for every single person, and it's something that's always a work in progress, so don't get discouraged if you're going through a rough patch. It's just important to do what's best for you, and there's absolutely no shame in reaching out if you need help. In fact, it takes a lot of courage to do so.